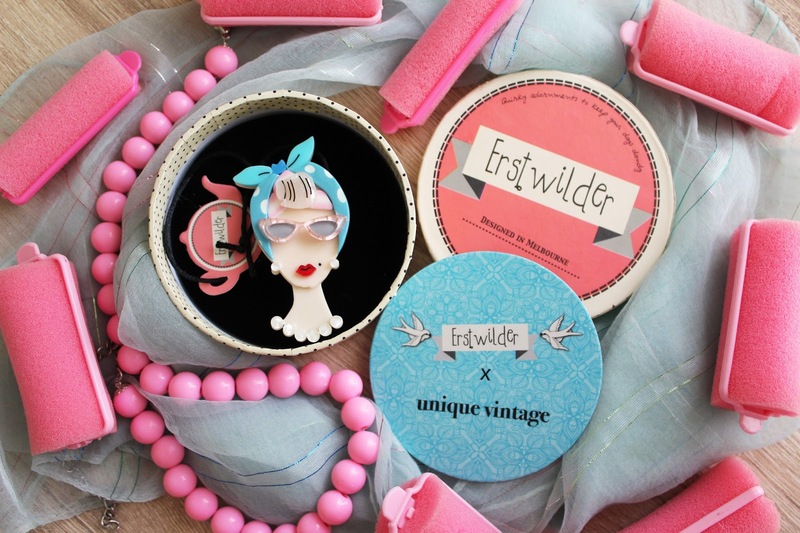 Presenting an amazing Erstwilder + Unique Vintage collaboration on the blog today! 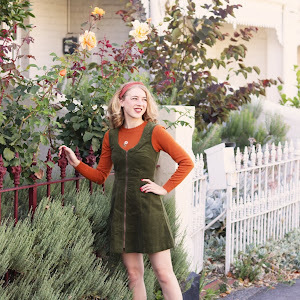 I feature a lot of Erstwilder and Unique Vintage on the blog, not only are they wonderful companies to work with but I absolutely love the products and can honestly say that I wear what I have featured on the blog continuously. You can probably imagine how excited I was once I found out that these two companies collaborated to release an exclusive brooch, dress and skirt design... All matching and all so pretty! The Rollin' with Katie brooch reminds me a bit of myself, I use pink foam rollers and look like her a majority of the time (I have my pink rollers in my hair as I write this post), I also love fun sunglasses and necklaces, maybe that is a bit broad but she likes the same things that I do, haha. The brooch itself is really beautiful and has such lovely details; the day after it arrived I couldn't help but wear an outfit inspired by Katie, see here on my Instagram. Next up I had to decide between the skirt or the dress by Unique Vintage, as gorgeous as the skirt is the dress is more my style in terms of prints. 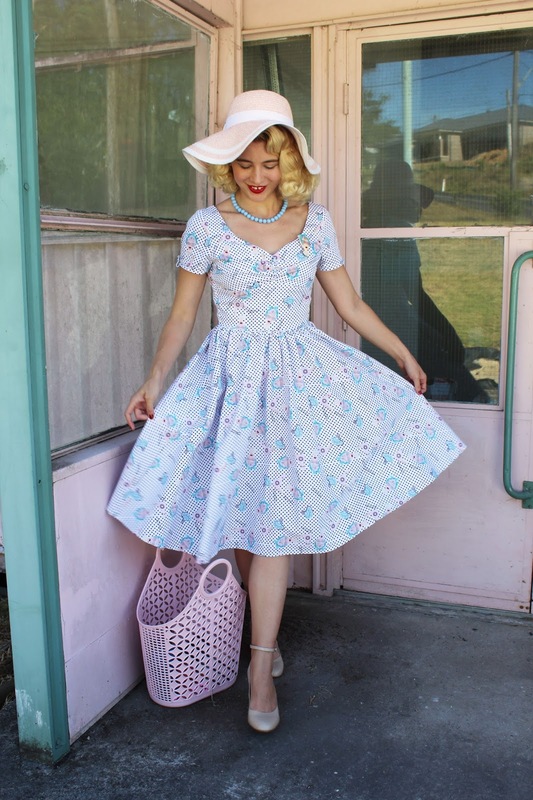 I love the cut of the dress, the small polka dots, the Rollin' with Katie brooch printed on the dress, the bobby pins and hairdryers - seriously cute. I am always pleased how well Unique Vintage brand clothing always fit and how accurate the size guides are. If you follow their size chart you shouldn't have too much trouble picking the right size... I am wearing size small and it is once again an accurate fit. This dress is also made of cotton which I am always thankful for during summer, it was very breathable on a hot day. I was also happy to see that the products have my favourite colour combination, pink and blue. That was one of my first thoughts when I had a look at the product images so I continued with that theme and styled accordingly. When it's not so hot it would look so cute with a cardigan over top as well. I know that I wear sun hats a lot in my outfit posts but this is what I wear throughout summer so I like to represent my style as it is on the blog, even if it seems a bit repetitive... plus I own a lot of sun hats because it is important to own many hats in various colours when you live in sunny Australia right!?! Speaking of the weather, it was so hot last night, today and well it has been a bit of a heatwave, again... I mentioned last in my last blog post that sometimes it feels like my brain is melting in the heat, well I almost forgot to wear mascara today and I forgot an accessory or two. I left the house extra early so I could take these photos, but it was 31 degrees even at 7am!!! I'm happy to say that the weather has cooled down this afternoon - oh the relief! As you can see I am over the moon with this collaboration between Erstwilder + Unique Vintage and couldn't wait to share this look here on the blog. 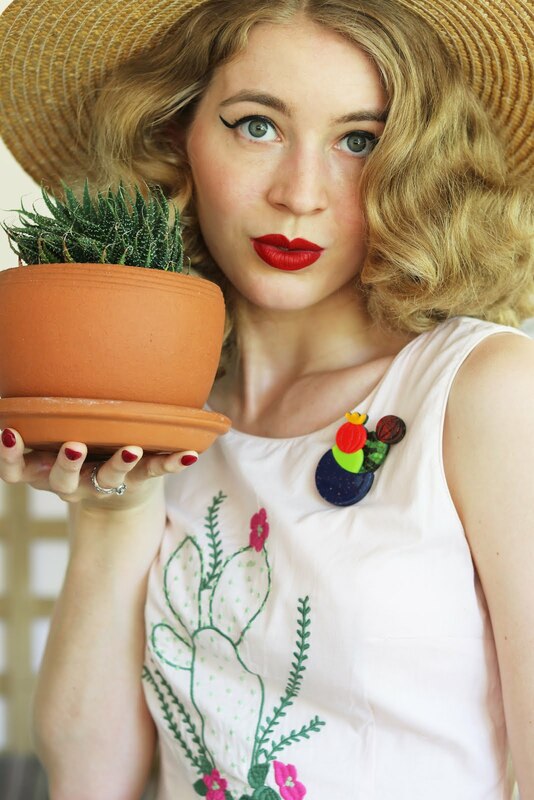 The brooch is available for purchase at Erstwilder and the dress + skirt can be purchased directly from Unique Vintage (the brooch can also be purchased at UV). You can follow me direct links above which will take you straight to these products. Such a fun print! I can see why you couldn't resist it! And when I first saw the pictures of this brooch, it reminded me of you straight away, definitly a Kayla brooch! Oh gosh, the brooch DOES look like you! Haha! So cute - I cannot get over this matching set. It's such a precious collab for these two companies!